World leaders at the UN climate talks have just set a landmark goal that can save everything we love! This is what we marched for, what we signed, called, donated, messaged, and hoped for: a brilliant and massive turning point in human history. It’s called net-zero human emissions -- a balancing of what we release into the air and what is taken out -- and when the dust settles and the Paris Agreement is in the hands of lawmakers, clean energy will be the best, cheapest, and most effective way to keep their promise. This gives us the platform we need to realize the dream of a safe future for generations! This moment took a movement. In the last weeks, our community has played an extraordinary role to help push through this historic deal. After we smashed global records, marching in the hundreds of thousands all over the globe, we brought our voices into the summit -- literally -- with a chorus of members’ personal messages as delegates entered, Avaaz staff then delivered our petition directly to the UN Secretary-General, kicking off an incredible string of campaigns. "When in 2014... hundreds of thousands of people marched in the streets of New York, it was then that we knew that we had the power of the people on our side." Christiana Figueres, Head of UN climate talks, speaks to the power of our marches in her closing speech to the summit today. From the starting gun to the finishing line of these talks, every time a government blocked progress, we responded, and when they led the way, we heralded them. Our community has called our leaders to go further in 45 different actions in just 14 days. And we had incredible impact. And that was just the beginning -- our marches, messages, and video appeals were played on loop outside of the main negotiation room. Heads of state, ministers, and all of their staff were reminded of us and our calls to action every day. 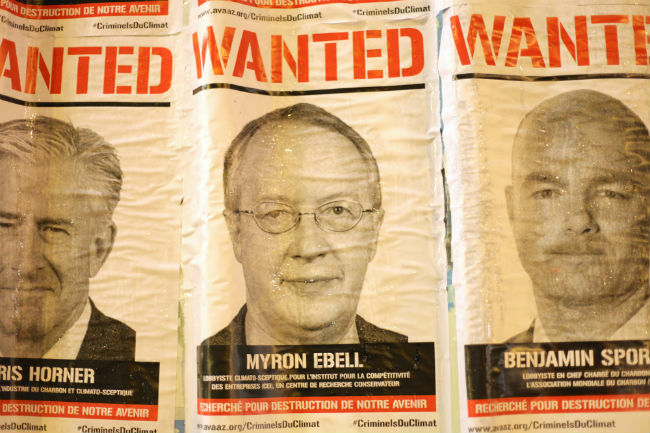 Then, after we plastered Paris with posters of the faces of the worst fossil fuel lobbyists and climate deniers, calling on ministers to ignore them, the lobbyist for the world's largest mining company withdrew from the talks altogether! When it became apparent Argentina and Saudi Arabia were major blockers, Avaaz members in both regions went into urgent action, and we were all over the media. In Argentina, the newly elected President, who had committed to renewable energy, was inundated with messages to send a delegation to Paris. And within days they came. The Saudi government was so worried by the public attention that a lawyer representing the Kingdom called our staff to say they would sue. And just a few hours ago, the German minister personally thanked Avaaz members for making her and her delegation feel consistently supported throughout the negotiations. But probably the single most effective thing our community did was raising hundreds of thousands to support a strong Marshall Islands presence at the talks. Their Minister became one of the heroes of Paris -- announcing a High Ambition Coalition that cut through the toxic North / South divide, and got 100 countries to work together. 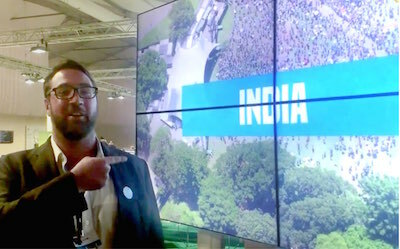 When they called for others to join them, Avaazers launched campaigns and started texting the delegates of big emerging economies -- within hours Brazil responded to Avaaz staff, and 48 hours later they joined the High Ambition Coalition, too. And that's just a few of the amazing campaigns we rallied around in this short time! Everyone expected failure from the climate process. 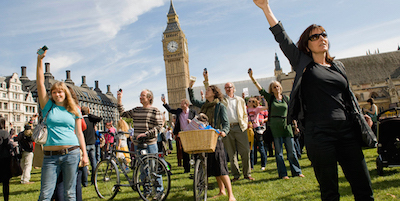 Leaders told Avaaz staff over and over again, "people don't care about climate change”. But we knew better. We knew this community of millions consistently chose saving our planet as a key priority for our work together, year after year. 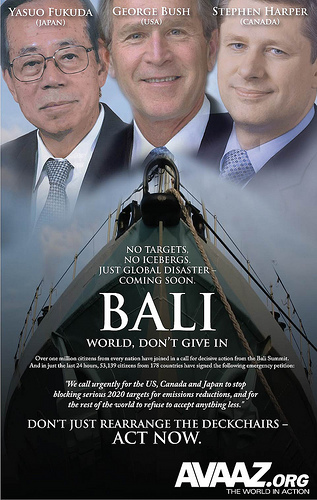 Our movement's journey on climate began in Bali eight years ago, when Avaazers sent thousands of messages to blocker countries and funded a newspaper ad that Japan’s largest newspaper credited with changing the government’s position. Together, we helped push leaders to agree to a roadmap that paved the way for Copenhagen's big climate talks and the eventual deal in Paris. With talks stalling, our community put everything on hold to focus on the Copenhagen Summit -- spearheading hundreds of vigils and rallies around the world, making hundreds of thousands of calls to decision-makers, delivering millions of petition signatures, and leading a Global Wake-Up Call to presidents and prime ministers. Leaders failed to make history, but as one Avaaz member put it: “the elephant began to move, and when an elephant starts moving, it’s hard to stop..."
"You have driven forward the idealism of the world...do not underestimate the impact on the leaders here." While the result of Copenhagen was disappointing, our movement never gave up hope. 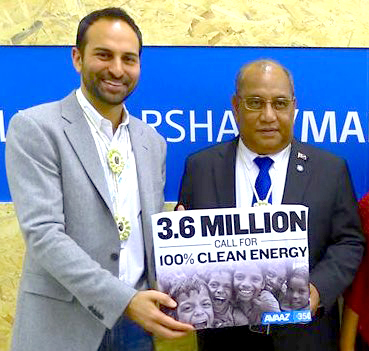 Instead, in every country, at every opportunity, Avaaz members kept fighting tooth and nail for the policies we needed on climate. We staged a protest at the Durban Summit in solidarity with developing nations, held candlelight vigils in the wake of the Japan nuclear disaster, and created a global petition of 1.5 million to save the precious Amazon. Copenhagen taught us we needed to be much bigger if we were going to defeat the fossil fuel lobby move our leaders to action. And that's what we did: growing from 3 million to over 30 million members! 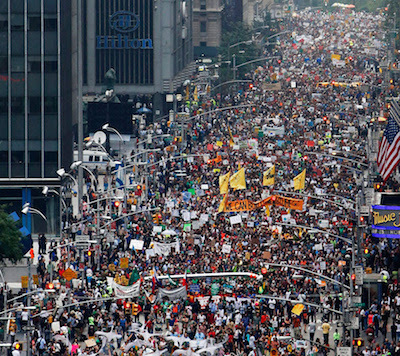 Working with many partner organisations and after months of preparation, we staged the biggest climate march ever on the eve of a critical UN Climate Summit -- 400,000 people in NYC and another 300,000 across the globe -- all with one powerful message: the world wants 100% clean energy. Weeks later, the US and China signed a landmark agreement to reduce emissions. The political momentum on climate had changed. "Our citizens keep marching. We cannot pretend we do not hear them. We have to answer the call." Using the momentum from the marches, we focused our attention on the richest economies and pulled out all the stops to support Germany’s leadership of the powerful G7. Thousands of us funded opinion polls and hard-hitting ads calling out key countries blocking climate progress, we delivered our 2.7 million-strong petition in person to all key German and French ministers -- meeting in person with French President Hollande. Hundreds of Avaazers followed Germany's Chancellor Merkel at nearly every public event she attended, urging her to be a climate hero. The result? 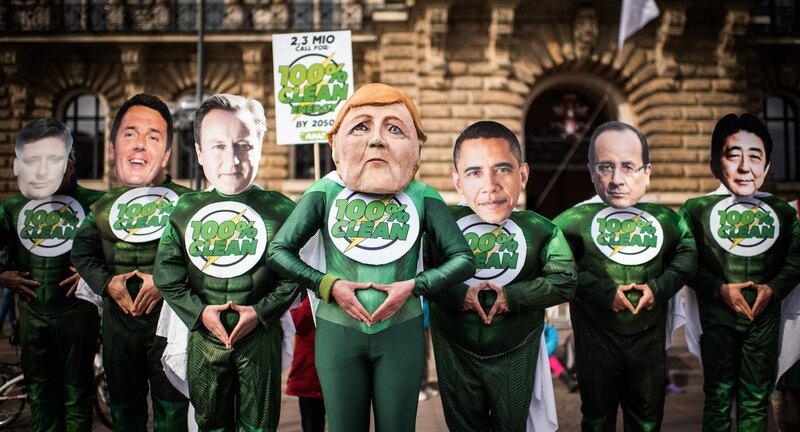 G7 leaders said goodbye to fossil fuels by committing to phase out carbon pollution over the course of this century! The tide was turning. 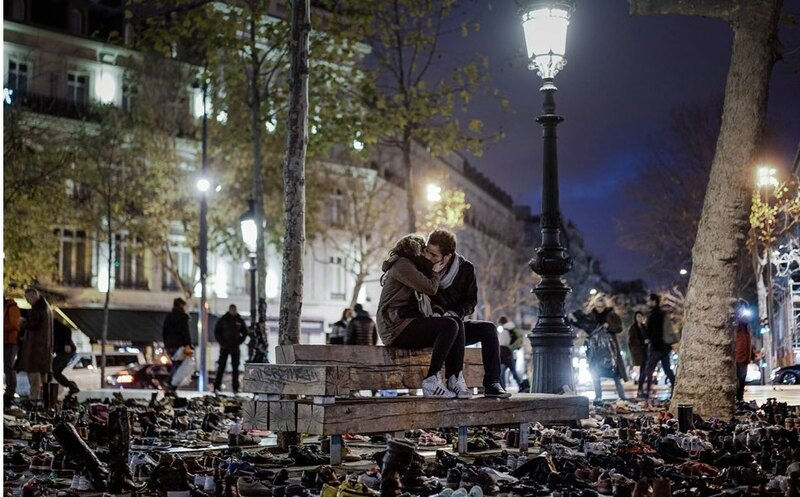 Avaazers then answered with hope and creativity, and in just a few days we collected and displayed in Central Paris an incredible installation of over 22,000 shoes symbolising all the protesters who couldn’t march -- the Pope and the UN Secretary-General added their shoes, too! 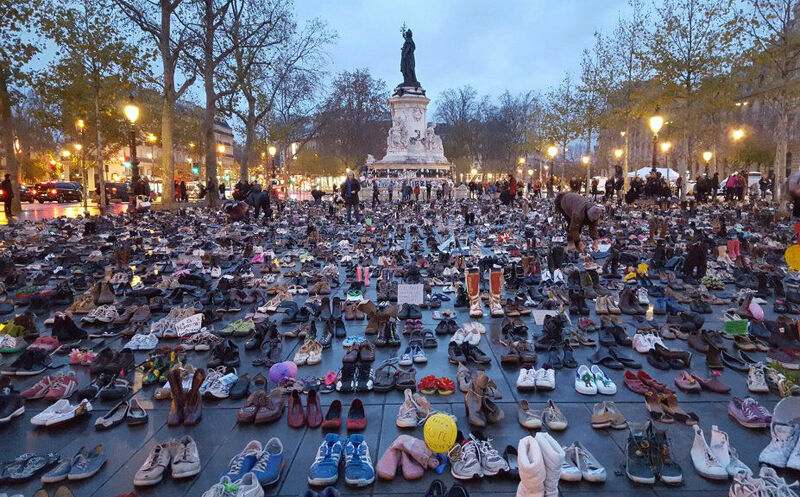 And as world leaders arrived in Paris, we broke our own record! 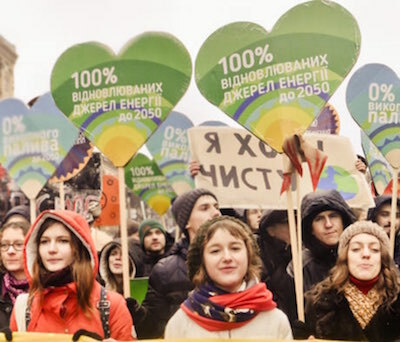 From São Paulo, to Sana’a, to Sydney, over 785,000 people marched at 2,300 events in 175 countries united in one voice calling for a 100% clean energy future to save everything we love. Imagine if the hundreds of thousands expected had marched in Paris and across France, too! 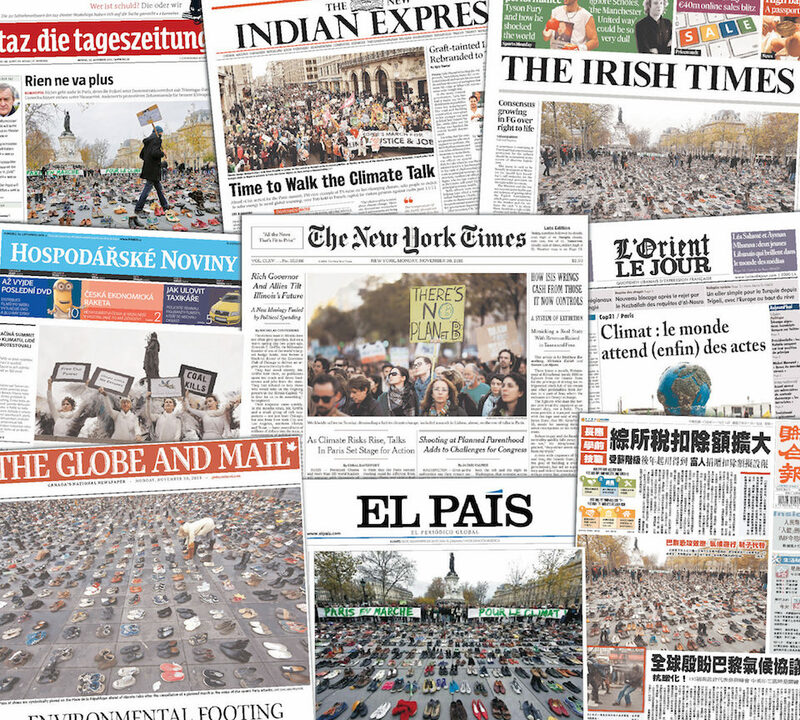 Messages and footage from the global marches spread like fire, on the front page of dozens of major newspapers, covered by hundreds of global and national news outlets, and beamed on a big screen at the heart of the conference centre. The tone was set. We have decades of work ahead of us to live up to the promise of this moment. We need more ambition to meet our 100% clean energy by 2050 target, improving on the deadline of "the second half of the century" now in the agreement. We need rich countries to give more money to developing countries so they can skip coal altogether and lift hundreds of millions out of poverty. We need to push governments everywhere to keep the planet’s warming under 1.5 degrees so that island nations can survive. And most importantly, we need to make sure all our governments keep the promises they made here in Paris. Most importantly, tonight sends a clear message to investors everywhere: sinking money into fossil fuels is a dead bet. Renewables are the profit centre. Technology to bring us to 100% clean energy is the money-maker of the future. History delivers moments when the wind shifts, you can smell it in the air. The best of us harness that power, using it to fuel the new path. Like our brothers and sisters in South Africa who won legal equality, LGBTQ members in the United States who won the right to marry the people they love, Gandhi's non-violent movement that gave birth to a new hope for India, we are on the brink of that new, sweet wind. Let's harness it together, let's fly together under the sail of a common humanity, across the oceans, rivers and lakes that divide us. Let's take the promise of right now and deliver our children a beautiful, safe, and clean future. WE WON!!! Global. Climate. Deal. Add a comment or a photo and let's celebrate this incredible moment we've worked for together.